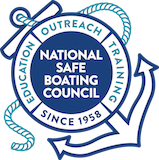 This Safety Alert reminds all operators of power-driven, sail, and human propelled vessels of the importance of maintaining a sharp look-out while on a shared waterway and recommends that all recreational boaters carry a DSC-VHF marine radio in order to communicate with other vessels. Recently a catamaran type passenger ferry collided with a group of kayakers on a busy metropolitan waterway. The incident occurred during late afternoon while the sun was low on the horizon with an angle of about 15 degrees and the ferry was heading westerly into the sun’s glare. The ferry had just begun its voyage and was operating at about 20 knots across the waterway while a group of kayakers was ahead of the ferry and heading south. The low angle of the sun created significant glare on the water, obstructing the ferry operator’s view of the kayakers who were within the reflected light. The kayakers did not have a DSC-VHF marine radio with them and they were unable to hail the ferry. The ferry subsequently collided with multiple kayaks resulting in two serious injuries. It is critical that all mariners, including recreational boaters, have a good working knowledge of the Navigation Rules before venturing out into a shared waterway. Commercial and recreational vessel operators need to know their responsibilities including the Steering and Sailing Rules, Conduct of Vessels in Sight of One Another, and Conduct of Vessels in Restricted Visibility. They also need to recognize the nautical lights and shapes and understand the sound and light signals that may be encountered in order to take appropriate actions to prevent collisions. It is also critical that recreational boaters are able to communicate with all other vessels. If unsure of another vessel’s intentions boaters need the ability to contact the other vessel on the radio in order to indicate their location and ask such questions as “Do you see me?” and “What are your intentions?”. For more information on navigation rules and maritime communications please visit the USCG Navigation Center Website. Operators of marinas and rental facilities are encouraged to develop guidelines for safety briefings, required safety equipment and for outfitting guides and renters with maritime communication devices. For more information please visit RentalBoatSafety.com. There are many safety topics important to paddlesport enthusiasts. Depending upon where you plan to paddle, the required skill sets may be minimal or they can be highly technical in nature. Persons new to paddlesports will benefit from taking a paddlesports safety course and the knowledge gained will increase their enjoyment on the water. An example of a free online course is located at boaterexam.com. Training is also available from the American Canoe Association (ACA) and United States Coast Guard Auxiliary. • Tell a friend where you are going and when you will return – file a float plan. The free Coast Guard Mobile App includes many resources including a function to file a float plan. This Safety Alert is provided for informational purposes only and does not relieve any domestic or international safety, operational or material requirement. Developed by the Office of Boating Safety and distributed by the Office of Investigations and Casualty Analysis, Washington DC. Questions may be sent to HQS-PF-fldr-CG-INV@uscg.mil.